A goal of VR is to evoke a sense of presence - to feel so immersed that you react instinctively. For example, you would feel compelled to move your head to avoid a projectile. I find that representing my breath in VR helps me to feel more connected to the environment, adding to an overall sense of presence. The demo shouldn't be very demanding on hardware and you can change the graphics quality using keys 1 to 9. You'll need a microphone that you can place directly in front of your mouth. It feels better if you wear a headset so you aren't consciously holding the microphone. You can also calibrate your mic within the demo. Keep in mind this is a quick prototype to test a concept. The techniques could be implemented more accurately. Feel free to download the source code and use in your own projects. The code uses Unreal Engine 4.7. 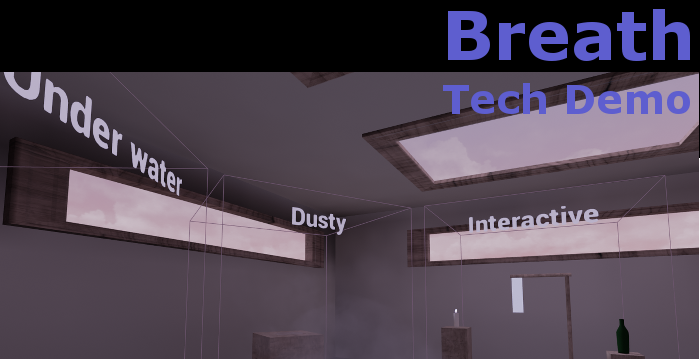 If you don't use Unreal Engine, see my post on reddit that briefly describes the techniques used. Read notes.txt (included in the download) for a brief overview. Remember to download the FMOD plugin for Unreal Engine or replace the audio with Unreal Engine functionality. As you walk in to the cold, you see your breath. This reinforces the fact that it's cold, but if we showed your breath randomly it would break any sense of presence. By representing your real breath rate and intensity we should be able to increase presence. Again we use the breath rate and intensity to show air bubbles being release under the water. Blow on a candle and see the flame move or go out. Blow over a bottle and hear the sound. Blow on cloth and see it move. Blow the dust around. Immersion should be increased by allowing you to interact with the environment as you could in real life. As you breath out you hear an exaggerated exhale. Then a laboured inhale. This is not too precise because I can't tell when you inhale - only that you aren't breathing out. It should still be clear that it's your characters breath and better than if the characters breaths were random. Maybe it will give you an uneasy feeling. * Show the chest of your avatar moving in sync with your breath. * Breathing on a window leaves condensation. * Blowing cob webs - web moves and wakes the spider. My hope is that future VR headsets will include breath detection (along with other biometrics). It may not seem like a big deal, but it's another step towards a greater sense of presence and an easy-win compared to getting your hands and body in to VR.